Foreign tourists using near the St. Basil's Cathedral in central Moscow. City looks for ways to attract more visitors. Tourists visiting Moscow from abroad spend on average $800 per trip, whereas Russian tourists spend $200 on a visit to the capital, according to Konstantin Goryainov, deputy head of the Department for National Politics, Interregional Relations and Tourism of Moscow, who presented the statistics to journalists at a recent press conference. 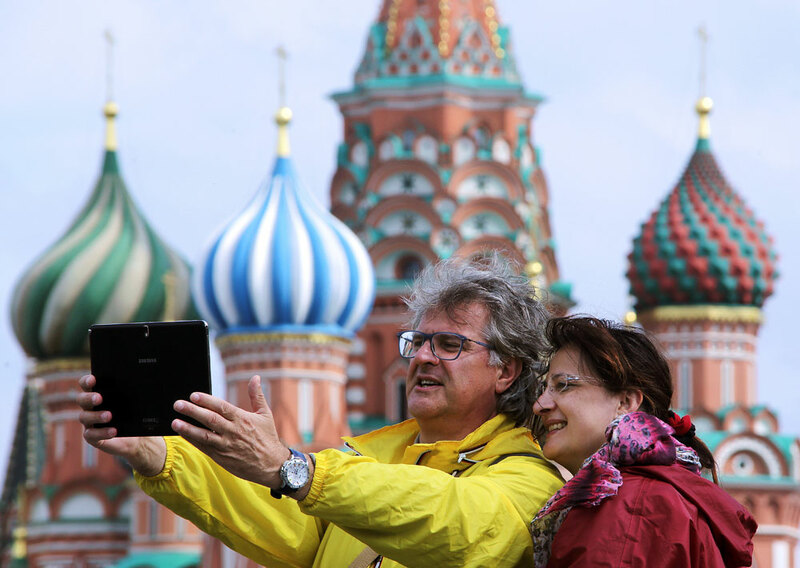 “Tourists who come to Moscow from abroad spend something in the region of $800 when they come. Since the start of the crisis, foreign spending in Moscow has fallen by half in Russian terms, as this is measured in dollars. Moscow needs to create more itineraries and offer better-quality services, in order to raise this amount by another 20-30 percent,” Goryainov said. He noted that while foreign tourists clearly prefer to fly to the city, more Russian tourists still arrive by train. Just over a third of Russian tourists travel by rail compared with 25 percent who travel by air. Only 1 percent of tourists visit the city by boat, on a river cruise, for example. Maintaining and improving transport infrastructure is critical for attracting tourists, according to Goryainov. “There are already four international airports in Moscow, and 10 train stations. Half of foreign visitors to the country come via the capital — it is an important center for transportation,” Goryainov said. On average, Moscow hotels have been at 62-63 percent capacity throughout the year, slightly up from the before. “We are interested in keeping hotel capacity at a steady average throughout the year; therefore we introduced an events calendar showing 500 events in Moscow, spread out over the four seasons,” Goryainov said. “Tourism’s contribution to the region’s GRP (Gross Regional Product) is at about 3-4 percent, however in Moscow itself this figure doubles to about 6-8 percent and brings in trillions of rubles of GRP,” he added. According to the statistics presented at the event, there were 17 million individual arrivals to the city in 2015, of which 2 million were foreigners. Tourists from China, Germany, Turkey and France make up the bulk of foreign tourists. First published in Russian by Interfax.